Best Homemade Playdough EVER! - Home. Made. Interest. 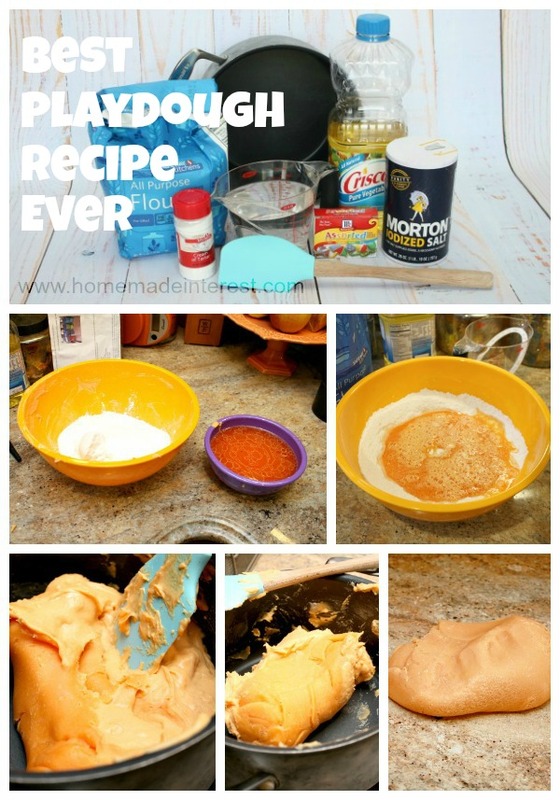 Home » Create » Crafts » Best Homemade Playdough EVER! I have made homemade playdough for a few years now. I’ve tested out several different recipes and techniques and I finally have it perfected. Below is my recipe for homemade playdough that is non-toxic and lasts for over 6 months. No more stinky playdough hands or hard little bits of dried out dough! *I do not suggest doubling the recipe, it becomes very difficult to stir and form it in the pot. Before you do anything else turn the burner to a medium heat and let it start warming up. Do NOT place the pot on burner, keep it to the side. In the large bowl, add the flour, salt, cream of tartar and mix with whisk. In the small bowl, add the vegetable oil, warm water, desired food coloring and mix with whisk. Now pour the contents of the small bowl of wet ingredients into the large bowl of dry ingredients. Mix with whisk until completely lump free. Now the fun part. Pour the mixture into the pot and place the pot on the preheated burner. Stir with a spatula. After a minute or so, you will notice the bottom is firming up and getting darker in color. Use spatula to fold dough over and into itself. It will begin to stick together and form a ball. Once it is all the same consistency and has formed into a large ball you are done. Flip it out of the pot and onto the counter, wax paper or a cookie sheet. BE CAREFUL it is very hot! Set it away from the kids so they don’t get tempted to touch it. After the dough cools slightly knead it with your hands and flip it. Once it cools completely, it is ready for everyone to enjoy! I store mine in gallon size zip-loc bags. It will last for several months as long as it is stored in a container or bag that seals tightly. Some recipe add-ins that are fun are, glitter for sparkly playdough and spices or extracts like cinnamon and peppermint for the holidays. My kids thoroughly enjoy playing with playdough and let’s be honest, so do I. Definitely going to try your recipe! My last attempt at homemade playdough was ok, but came out a little too sticky. Love your idea to add glitter too! Amy, let me know how it turns out.